An ESL lesson plan for teaching stative verbs to intermediate level students. It contains a lead-in activity, several classroom activities, a game and a list of suggested free ESL resources from around the web. The best way to view this content is through the TEFL Handbook app. So if you have an iOS or Android device, be sure to check it out. Use the board work below to introduce your students to the basic rules that apply to stative verbs. 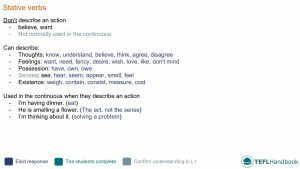 Step through each usage and elicit a list of example verbs. Draw a table on the board with two columns, dynamic and stative. Have the students copy this table into their books and populate it with the verbs from the board. When finished, they can compare their completed tables with a partner and work together to make sentences using the verbs. One sentence for each. For this ESL writing activity, students have to select five state verbs that they will use to make interview questions for their partner. As the students work individually on their questions, elicit potential follow-up questions and encourage their use in the interview. Teacher: Do you belong to a youth club? Teacher: Do you belong to any type of club? Student: Yes, I do Karate. Teacher: How long have you done karate? You should monitor the interviews for the correct usage of stative verbs and have the students report back on what they have learned from their partners when the interviews are finished. As always, we only include ideas that require the bare minimum of resources (whiteboard, markers, dice). You will need dice or dice app on your phone. To set this up, make a list of themes on the board and number them, six will be enough. Then make a separate list of 6 or 12 stative verbs and number them. For each round, players roll the dice to select a theme and a stative verb. To win a point, they must then make a grammatically correct sentence from those selections. You can play this as a head to head, individual or team game. Give one point for a correct sentence. If you're playing a team game, give a bonus point to the team with the funniest statement and set a time limit. 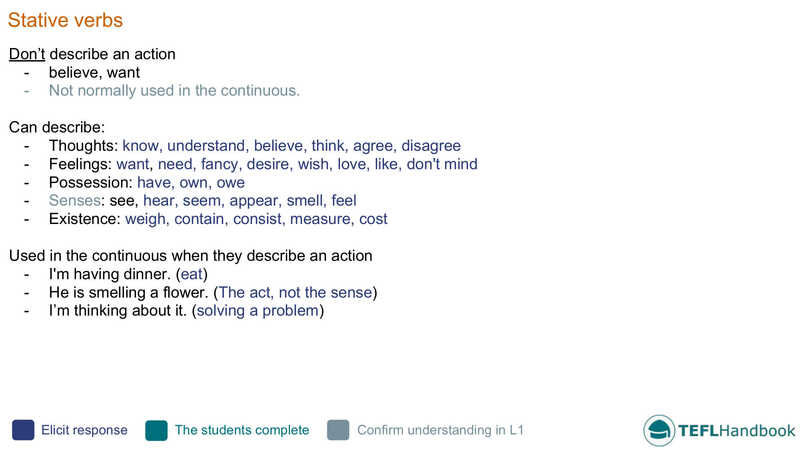 islcollective have a State or action verb worksheet that's perfect for revising everything covered in this lesson plan. The video below from BBC Learning English is an excellent resource for teachers who are thinking about how to present this topic in class. You should prepare some comprehension questions for your students and use them to drive group discussion after. If you've found these ideas useful, be sure to check out our complete list of ESL lesson plans for intermediate level students. For other levels, see the entire collection of ESL lesson plans. Our suggested next lesson is on comparative and superlative adjectives. Also, iOS and Android users can access all of our materials through the TEFL Handbook app. An ESL lesson planner for English teachers.